Section 41: Arrest of Accused without Warrant. Section 156: Power of Police Officer to investigate cognizable case. Section 162: Use of Statements of witnesses in evidence. Section 170: Cases to be sent to Magistrate when evidence is sufficient. Section 172: Diary of Proceedings in investigtion. Section 173(8): Further investigation of case by police. Section 386: Powers of the Appellate Court. In non-bailable and cognizable offences, arrest of accused is the discretion of the Police. Police can complete investigation without arresting the accused. Police can submit the charge-sheet without producing accused before the Court. Police can conclude the investigation and submit the charge-sheet as per its findings. Police is master of investigation and free to form its opinion. Magistrate cannot compel the investigation agency to change its opinion. Magistrate cannot order to reinvestigate the case for third time. Magistrate has power only to order ‘officer-in-charge of a police station’ to conduct investigation. Magistrate cannot direct CBI to conduct inquiry. Court cannot direct the Police to include a person as accused. Interference by the Court in investigation is unjustified. Use of case diaries by the Court should be very limited. Court should refrain from making comments on the manner of investigation. Court cannot direct investigating agency to investigate a case in a particular way. After taking cognizance and after appearance of accused, Magistrate cannot of its own order further investigation in the case. Appellate Court cannot direct State Govt. to file appeal against acquitted persons. Police Officer on whose report crime is registered is not the de facto complainant. He is fully competent to carry on the investigation. Police and Judiciary are two independent agencies of the Criminal Justice System. Their fields of work are different. One cannot interfere in the working of the other. However, sometimes, Courts try to influence the investigation and issue directions. 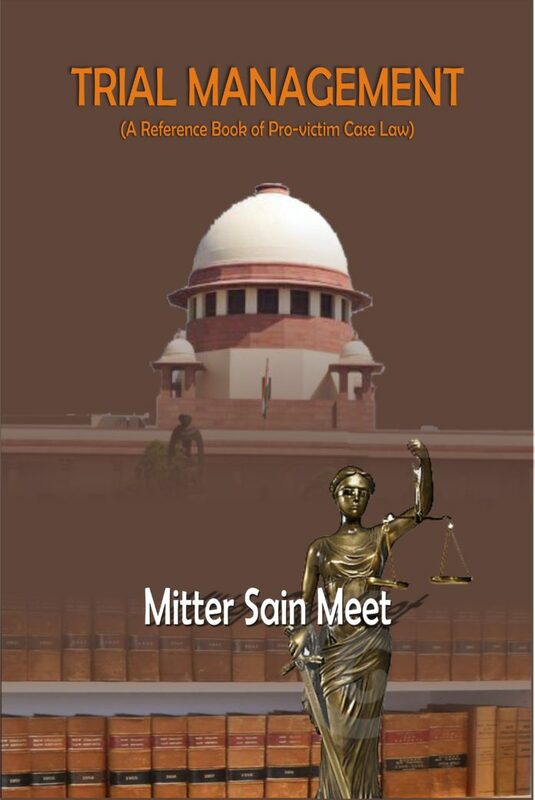 The Hon’ble Supreme Court and High Court have many times interfered to define the domain of their respective fields. Arrest of the accused is the discretion of the Police – Court cannot direct the Police to arrest or not to arrest an accused. Court cannot direct the Police to submit the charge-sheet in accord with the views of the Court. MAPL was the joint venture of the Govt. of India and the State of Maharashtra. It was declared as a sick industry by the Board for Industrial and Financial reconstruction. The Commissioner of Provident Fund lodged a complaint with the Police alleging offences u/Ss. 406 & 409 of IPC read with Section 34. Some accused moved the High Court for the grant of anticipatory bail. Those petitions were dismissed by the High Court. Despite the rejection of the anticipatory bails, the Police did not arrest the accused. Employees Association of MAPL filed a petition in the High Court with the prayer that the Police may be directed to arrest the accused and to complete the investigation. The High Court vide order dated 10/01/2002 directed the State ‘to cause arrest of the accused and to produce them before the Court immediately.’ On the next day, during the course of hearing, it was brought into the notice of the High Court that two Directors of MAPL were appointed by the Govt. of India and they were not concerned with the day to day working of the establishment. On this ground the complainant of the case requested the investigating agency not to take action against these accused/Directors. It was also brought to the notice of the High Court that the funds were not misappropriated by the accused. Vide order dated 11/01/2002; the High Court observed that this could not be the reason for not proceeding further in the matter. While feeling aggrieved, the accused filed criminal appeals in the Hon’ble Supreme Court. One contention of the accused was that Court has no power to direct the police to arrest a particular accused. Another contention was that Court cannot direct the police to submit the charge in accord with its views. Whether Court can direct the Police to arrest or not to arrest an accused? Para “14. ….. In the first place, arrest of an accused is a part of the investigation and is within the discretion of the investigating officer. Section 41 of the Code of Criminal Procedure provides for arrest by a police officer without an order from a Magistrate and without a warrant. The section gives discretion to the police officer who may, without an order from a Magistrate and even without a warrant, arrest any person in the situations enumerated in that section. It is open to him, in the course of investigation, to arrest any person who has been concerned with any cognizable offence or against whom reasonable complaint has been made or credible information has been received, or a reasonable suspicion exists of his having been so concerned. Obviously, he is not expected to act in a mechanical manner and in all cases to arrest the accused as soon as the report is lodged. In appropriate cases, after some investigation, the investigating officer may make up his mind as to whether it is necessary to arrest the accused person. At that stage the Court has no role to play. “17. The principle, therefore, is well settled and it is for the investigating agency to submit a report to the Magistrate after full and complete investigation. The investigation agency may submit a report finding the allegations substantiated. It is also open to the investigating agency to submit a report finding no material to support the allegations made in the first information report. It is open to the Magistrate concerned to accept the report or to order further enquiry. But what is clear is that the Magistrate cannot direct the investigating agency to submit a report i.e. in accord with his views. Even in a case, where a report is submitted by the investigating agency finding that no case is made out for prosecution, it is open to the Magistrate to disagree with the report and to take cognizance, but what he cannot do is to direct the investigating agency to submit a report to the effect that the allegations have been supported by the material collected during the course of investigation. 4. Police can produce the charge-sheet without producing accused before the Court. Court cannot return the charge-sheet. In this case, the CBI was investigating a case against an IRS Officer allegedly involved in a fake visa racket during his posting in Tanzania as a diplomat. The case was registered under the Prevention of Corruption Act and Section 409 of IPC etc. The accused was not arrested as CBI did not deem his arrest necessary for investigation. After the completion of investigation when the Investigating Officer went to the Trial Court to present the charge-sheet, the Court declined to accept the charge-sheet. The chargesheet was declined on the ground that CBI was not observing a uniform policy in arresting the accused persons during investigations. The plea of CBI that provisions of Section 170 Cr.P.C. did not apply in the present case and that the arrest of the accused is not mandatory for completing the investigation was not accepted. It directed the CBI to arrest him and to produce him in custody while presenting the charge-sheet. This extra ordinary behavior of the Trial Court was published in the Newspaper’s. The Hon’ble Delhi High suo moto Court took the notice and decided the matter. Whether police can complete investigation without arresting the accused? Whether it is legally permissible for any criminal Court to refuse to accept the charge-sheet where accused is neither arrested during investigation nor produced in custody by the Investigating Officer at the time of filing the charge-sheet wherever there is sufficient evidence to try the accused? “Para 19…………… It appears that the Special Judge was labouing under a misconception that in every non-bailable and cognizable offence the police is required to invariably arrest a person, even if it is not essential for the purpose of investigation. “20 Rather the law is otherwise……. Police can produce the charge-sheet without producing accused before the Court. Court cannot return the charge-sheet. “4……… Now the question arises whether it is legally permissible for any criminal Court to refuse to accept the charge-sheet where accused is neither arrested during investigation nor produced in custody by the Investigating Officer at the time of filing the charge-sheet wherever there is sufficient evidence to try the accused. Answer is emphatic “NO” as Section 173 of the Code of Criminal Procedure does not permit the criminal Court to adopt such a course. Such a course is even otherwise fraught with serious consequence of failure to take cognizance of the charge-sheet if it becomes barred by time in the process of procuring the custody of the accused for production before the Court as law provides a limitation for taking cognizance of the chargesheet. Moment the charge-sheet is filed, it is the duty of the Court to accept it. It has no powers to return the charge-sheet directing the Investigating Officer to first produce the accused in custody. It is not imperative or necessary for the officerin-charge of the police station to forward each and every accused in custody at the time of filing of the charge-sheet wherever there is sufficient evidence to try the accused. 5. Police is master of investigation and free to form its opinion. Magistrate cannot compel the investigation agency to change its opinion. 6. Magistrate cannot order for reinvestigation of the matter for the 3rd time. The accused of this case was a Government Servant. He was demanding bribe from the complainant in consideration of shifting of his telephone from one premise to another. The complainant approached the CBI and got him arrested while accepting the bribe. After completing investigation the CBI came to the conclusion that there was no motive for the accused to demand bribe from the complainant. A closer report was filed by the CBI in the Trial Court. The Trial Court did not agree with findings of the CBI and returned the closer report with the direction to further investigate the matter. CBI followed the direction and further investigated the case. Again CBI came to the conclusion that no case is made out against the accused. Second closer report was again file in the Trial Court. The Trial Court again did not accept the closer report and returned the case to the CBI for further investigation with the similar observation. Feeling aggrieved accused challenged the second order of the Trial Court in the Hon’ble Punjab & Haryana High Court. One contention of the accused was that Magistrate has no power to compel the investigating agency to change its opinion. It was further contended that Magistrate cannot order re-investigation of the matter for the third time. Whether Magistrate can compel the Investigating Agency to change its opinion? Whether Magistrate could order for re-investigation of the matter for the third time? 7. Magistrate has power only to order ‘officer-in-charge of a police station’ to conduct investigation. 8. Magistrate cannot direct CBI to conduct inquiry. Before the decision of this case, the various High Courts were of the different views. One set of High Corts was of the view that Magistrate has power to direct the CBI to conduct the inquiry. Another set of the High Courts was of the contrary view. Whether Magistrate has power to direct the CBI to conduct an inquiry? Para “6. If the power of a Magistrate to order investigation by the CBI in noncognizable cases cannot be traced in the above provision, it is not possible to trace such power in any other provision of the Code. What is contained in sub-section (3) of Section 156 is the power to order the investigation referred to in sub-section (1) because the words “order such an investigation as above-mentioned” in subsection (3) are unmistakably clear as referring to the other sub-section. Thus the power is to order an “officer-in-charge of a police station” to conduct investigation. It is clear that a place or post declared by the Government as police station, must have a police officer-in-charge of it and if he, for any reason, is absent in the stationhouse, the officer who is in next junior rank present in the police station, shall perform the function as officer-in-charge of that police station. The primary responsibility for conducting investigation into offences in cognizable cases vests with such police officer. 2.Court cannot direct the Police to include a person as accused. 3.Interference by the Court in investigation is unjustified. 5.Court should refrain from making comments on the manner of investigation. It was a case known as ‘ISRO Espionage Case’. Initially, it was investigated by Kerala State. Then it was transferred to the CBI. While investigation was in progress, a PIL was filed in the Kerala High Court. It was prayed that Raman Srivastava, IPS, Inspector General of Police, State of Kerala, who was an accused in this case may be arrested. A single judge of the High Court dismissed the petition with the observation that the power of interference of the Court in the subject in hand at that stage was very limited. An appeal was filed in the Division Bench of the Kerala High Court. It was also dismissed on the same ground. While deciding the matter the Division Bench summoned case diaries of the State police as well as of the CBI. While disposing off the matter a reference at length was made in the course of the judgment and materially disclosed the matters recorded in the case diaries and statements of witnesses etc. The Hon’ble Division Bench also made some observations regarding the manner of investigation. Feeling aggrieved, Director CBI, Home Secretary etc. filed a special leave petition in the Hon’ble Supreme Court regarding these adverse observations. A Full Bench of the Hon’ble Supreme Court, while disposing off the matter, laid down the following principles of law. Whether Court can direct the Police to include a person as accused? Whether Court can interfere in the investigation? Whether use of case diary by the Court should be limited? when the investigation is at the initial stage? “4. ….. The Division Bench, therefore, should have refrained from disclosing in its order, material contained in these diaries and statements, especially when the investigation in the very case was in progress. It should also have refrained from making any comments on the manner in which investigation was being conducted by the C.B.I., looking to the fact that the investigation was far from complete…..”4. “4………The Division Bench, therefore, should have refrained from disclosing in its order, material contained in these diaries and statements, especially when the investigation in the very case was in progress. It should also have refrained from making any comments on the manner in which investigation was being conducted by the C.B.I., looking to the fact that the investigation was far from complete. Any observations which may amount to interference in the investigation should not be made. Ordinarily the Court should refrain from interfering at a premature stage of the investigation as that may derail the investigation and demoralise the investigation. Of late, the tendency to interfere in the investigation is on the increase and Courts should be wary of its possible consequences. In this case, a complaint was filed by the complainant with the police while alleging that her daughter Nandini was married to Indrajeet Mukherjee. The husband was maltreating his wife for want of more dowry. Her daughter was tortured both mentally and physically by the husband and his relations. It was further alleged that when complainant visited the house of the accused, Nandini was not present there. She suspected that Nandini has been murdered by her husband and others. A case was registered. Accused was arrested. Nandini was also recovered. Statement of Nandini was recorded U/s 164 of Cr.P.C. After some days Nandini moved an application before the Judicial Magistrate with the prayer that at the time of the recording of her first statement U/s 164 Cr.P.C. she was under the influence of drugs. Her statement may be recorded afresh. The said application was allowed by the Magistrate. Investigating agency was directed to arrang for recording of statement of the victim afresh. Feeling aggrieved, accused Indrajeet Mukherjee moved the Hon’ble Kolkata High Court with the prayer for the setting aside of the said order of the Judicial Magistrate. One contention of the Counsel of the accused was that Magistrate has no power to direct the investigating agency to investigate the case in a particular manner. Whether the Judicial Magistrate has any power or jurisdiction under the Cr.P.C. to direct the Investigating Officer to arrange for recording statement of the victim U/s 164 Cr.P.C.? Investigation of Criminal case is completely within the domain of police. Magistrate has no jurisdiction to direct the investigating agency to investigate the case in a particular manner. In this case, after completion of investigation, the charge-sheet was presented by the police in the Court. Tthe accused appeared in the Court and the case was fixed for considering the question whether charge should be framed or accused should be discharged. The Magistrate suo moto ordered for further investigation of the case. Feeling aggrieved, the complainant filed an appeal in the Hon’ble High Court. Finally the matter went to the Hon’ble Supreme Court for final adjudication. Note:- It was first case of its kind. There was no direct authority of the Hon’ble Supreme Court on this question of law. In view of the importance of the point the Hon’ble Supreme Court took the assistance of a Senior Advocate as amicus curiae, examined the related decisions of the Hon’ble Supreme and that of the High Courts on the matter. The Hon’ble Supreme Court framed the following question of law for consideration. Whether a Judicial Magistrate, after taking cognizance of an offence on the basis of a police report and after appearance of the accused in pursuance of the process issued, can order of his own further investigation in the case? 7. Appellate Court cannot direct State Govt. to file appeal against acquitted persons. In this case, more than twenty persons were died by reason of consumption of illicit country liquor and many more persons became blind. A case was registered against seller, vendor of the liquor shop and many other persons who supplied the same. The Trial Court only convicted the seller and vendor of the liquor shop and acquitted all others. The State did not file the appeal against this order. Only the convicted accused filed appeals in the High Court against the order of conviction. While hearing appeal of the convicted accused the Hon’ble Punjab & Haryana High Court directed the State of Haryana to file an appeal against the accused who were acquitted by the Trial Court. Feeling aggrieved against this order accused filed an appeal in the Hon’ble Supreme Court. One contention of the accused was that High Court has no power to direct the State to file an appeal. (2) of Cr.P.C. can issue a directive to the State Government to file an appeal against those persons who have been acquitted by the Learned Sessions Judge? The Hon’ble Supreme Court held that High Court has no power to direct the State to file an appeal. Sri. M. Venkatrao was a Police Officer and was working as Inspector of Police at the relevant time in the Task Force Wing of North Zone of the Hyderabad Metropolitan Area consisting of the Twin Cities of Hyderabad and Secunderabad. On a tip off he conducted the inquiry. While submitting his report, the Inspector recommended to the Deputy Comissioner of Police to register and investigate the case as per provisions of Cr.P.C. The crime was registered. The investigation of this case was entrusted to Shri M. Venkatao. The Investigating Officer apprehended accused no. A10. During interrogation that accused made a confessional statement before him. Pursuant to that statement, the I.O. seized certain articles under the cover of panchnama. During the course of his examination in chief, an objection was taken by the Defence Counsel on the premise that the investigating officer was not competent to record confessional statement as he was a complainant of the case and that the complainant cannot investigate a case. On this objection, further examination of the witness was postponed. Feeling aggrieved, the State filed the present revision petition in the Hon’ble Andhra Pradesh High Court. One contention of the accused was that as the Investigating Officer was himself the complainant of the case, so he was not competent to investigate it. Whether investigating officer on whose report case is registered is competent to continue the investigation? A) Arrest of accused is must when disclosure of cognizable offence is made out. To decide the matter whether after the disclosure of a cognizable offence, the arrest of the accused is mandatory or optional a Five Judges Bench of the Allahabad High Court was constituted in case Dr. Vinod Narain v/s State of U.P., 1996 Cri.L.J. 1309. The judges held different views. Majority View:- Once disclosure of a cognizable offence is made out, arrest of the accused or suspect is mandatory. Minority view: – An unfettered licence to arrest the accused pursuant to the FIR is not given to the police. a) Some of the policemen on duty in the Crime Branch Office of Nagpur City took into custody one Junious Adam Illamatti, a resident of Ajni Railway Colony on 23-6-1993. While he was in police custody, he was found dead. When his wife Jarina Adam went to the Police Station to enquire about her husband, she was also locked up by the Police and molested. On 26-6-1993, a criminal case was registered for offences under Ss. 302, 342, 330, 354 read with S. 34 against 10 police officers. The investigation in this regard was conducted by a Deputy Superintendent of Police, State CID (Crimes) Mr. Godbole. After investigation said police officers were charge-sheeted for the offences mentioned hereinabove and in the trial the Additional Sessions Judge, Nagpur, said 10 police officers were acquitted of the charge under S. 302, I.P.C. but were convicted for offences punishable under S. 333 read with Ss. 34, 342 read with Ss. 34, 355 read with S. 34, and a punishment of 3 years’ R.I. with fine for the principal offence was awarded by said Sessions Judge to the abovementioned 10 Police Officers. A criminal appeal against the said judgment and conviction was pending before the High Court. b) On 29-9-1993 Criminal Writ Petition was filed initially by Christian Community Welfare Council of India. Subsequently, Jarina Adam wife of deceased was also impleaded as petitioner No. 2. In the said writ petition inter alia a direction was sought to the respondent-State to conduct a proper inquiry into the custodial death. There was a prayer to direct the respondent-State to pay compensation of Rs. 10 lacs to the second petitioner. c) The High Court by an order issued various directions in regard to the laying down of guidelines to prevent and check custodial violence and procedures to be followed by Police while arresting any person as also procedures to be followed by the Police after arresting such person, procedures to be followed in arresting a female person, manner in which such female person is to be detained etc. “The State Government should issue instructions immediately in unequivocal and unambiguous terms to all concerned that no female persons shall be detained or arrested without the presence of lady constable and in no case, after sunset and before sunrise.” The State of Maharashtra filed an appeal in the Hon’ble Supreme Court. While agreeing with the object behind the direction issued by the High Court, the Hon’ble Supreme Court observed that a strict compliance of the said direction, in a given circumstance, would cause practical difficulties to the Investigating Agency. It might even give room for evading the process of law by unscrupulous accused. The Hon’ble Supreme Court felt need for modify the above mentioned direction. Arresting authority should make all efforts to keep a lady constable present. But in circumstances if lady constable is not available or delay in arrest would impede the course of investigation, Arresting Officer, for reasons to be recorded, can arrest female person for lawful reasons at any time of day or night even in absence of lady constable. Para “9…..in circumstances where the Arresting Officers is reasonably satisfied that such presence of a lady constable is not available or possible and / or the delay in arresting caused by securing the presence of a lady constable would impede the course of investigation such Arresting Officer for reasons to be recorded either before the arrest or immediately after the arrest be permitted to arrest a female person for lawful reasons at any time of the day or night depending on the circumstances of the case even without the presence of a lady constable.